Traveling with a 2 or 3 year old can be a daunting experience. In our heads as parents, many things can easily go haywire. And frankly, it could. But often, when you properly prepare for trips like this, it can turn out to be a memorable experience for the whole family. 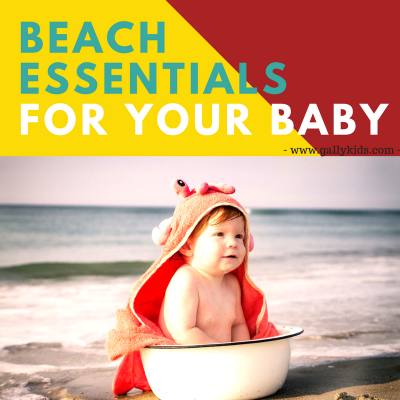 When it comes to kids this age, toddler travel kits and small toys can come very handy. 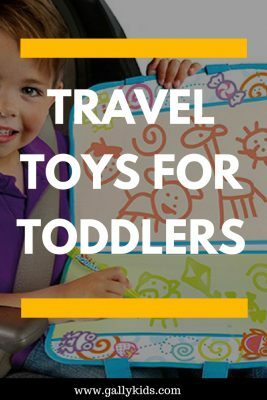 On this list, we have some of the best toys for toddlers in the car and on long haul flights. 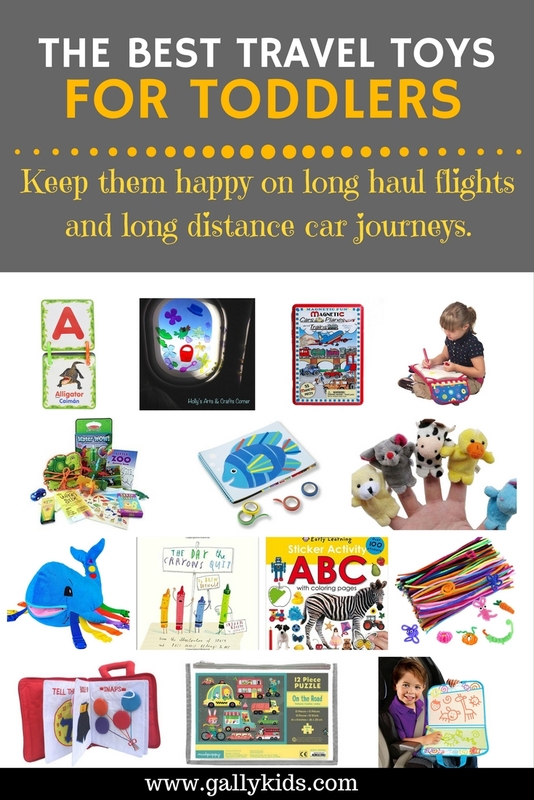 Here’s our list of the best toys for toddlers for car trips and long-haul flights. Tip: Wrap each toy or activity to make it more fun! Toddlers love opening presents no matter how small it is! The perfect size for traveling. 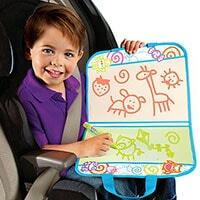 Get your toddler busy learning while you drive. 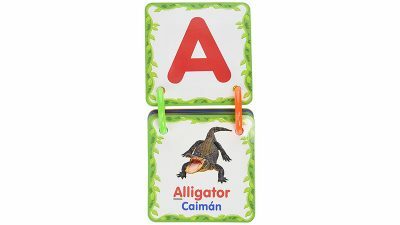 This travel flashcards book has 40 sturdy pages for learning the alphabets, animals, shapes, colors and numbers. It has a handle which is also a teether. Finger puppets of 10 different animals. They are just the right size to fit little fingers. 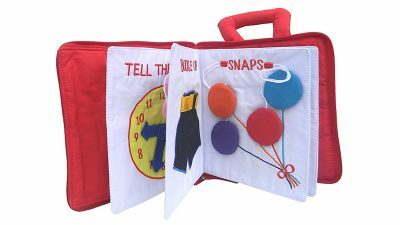 This is great for pretend play or for storytelling while traveling. This might seem too simple, but toddlers love this toy. It's a very simple activity but one that will keep your 2 or 3 year old occupied for a long time. This packet includes 4 tapes and a reusable book. Each page in the book has different “unfinished” drawings. Using strips of paper, your child can then finish the drawing by filling the spokes of a wheel, the stripes of a zebra, etc. Works better on plane journeys than car rides. Mess free drawing for the little ones. A special drawing mat and an Aqua doodle pen are all your child needs. Just fill the pen with water and your child can draw away. No need for crayons or pens! The mat is sturdy (unlike the traditional doodle mat) so can be used on the lap when traveling by car. 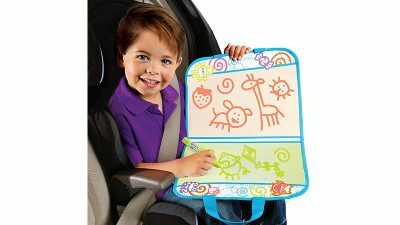 Oh the many things your toddler can do with the Lewo Magnetic and drawing easel. This is an all around travel toy. 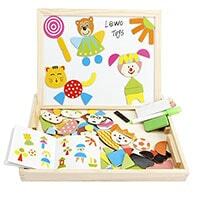 It’s blackboard and a whiteboard and and it has over 100 wooden magnetic pictures. An entertaining toy that’s also educational. 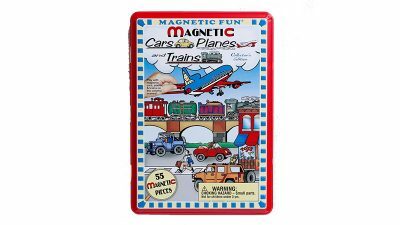 A lovely tin container with over 55 magnets that are travel themed. 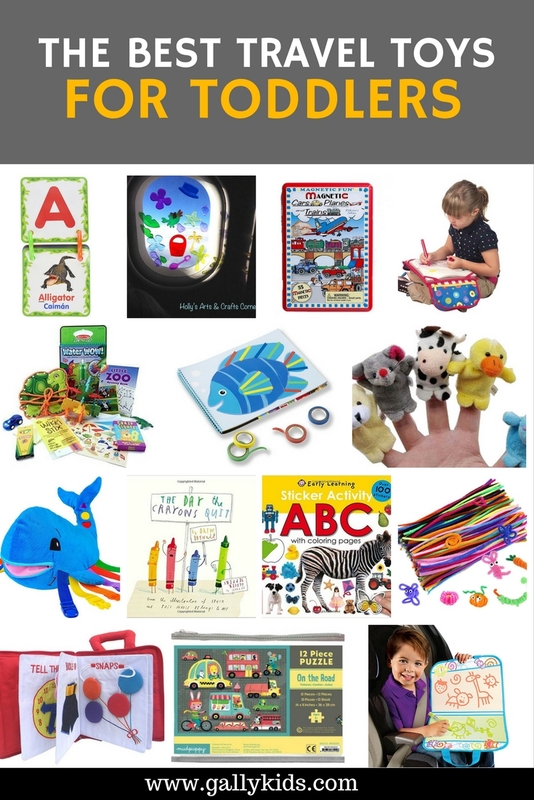 This is easy to pack and carry and if your child loves any type of transportation, this is a great tool for teaching colors, vocabulary or numbers. Tins with different themes also available like Disney Princesses, Farms, Cars or Silly Faces. 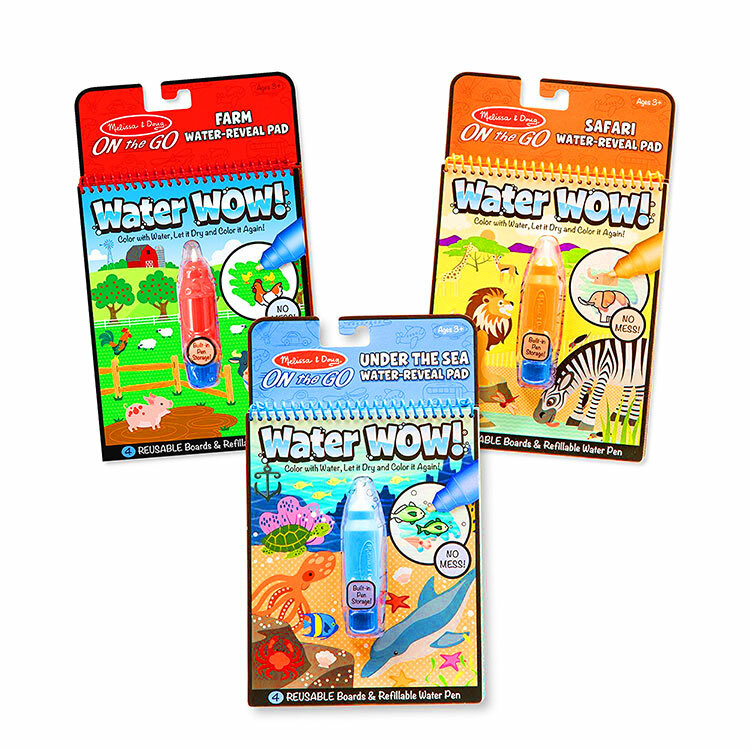 This pack has 3 different water pads with a travel theme: safari, under the sea and farms. No need to take coloring pens or crayons with you. And you don’t have to worry about paint getting all over the seats! This is a mess-free color water pad. Just fill the pen with water and as your child “draws” on the pad, colorful pictures are revealed. These are gel window clings/stickers. And they turn out to be very entertaining for kids for sticking on to plane or car windows! I don’t know what flight attendants think about it, but it sure is a great idea. If you have a 2-year-old, you’ll find that this is about the time when buckles are fascinating. A toddler can spend a long time simply buckling and unbuckling this Buckle toy. 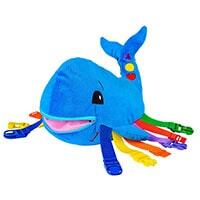 This is a colorful and sturdy toy with 6 buckles to play with. A developmental toy that’s also very fun. 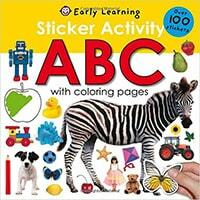 A fun and educational sticker book for kids. 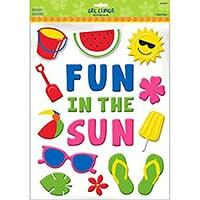 This includes over 100 different stickers to help toddlers learn the alphabets, numbers, and shapes. There are also a few pages that your child can color on his own. 6 Different activities in one. You can also make one yourself if you have the inclination to do it! 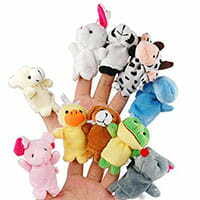 These Velvet Animal Finger Puppets are light and easy to carry. In my book, that’s always a good thing for traveling. When they have the potential to be fun, too, it’s even better. 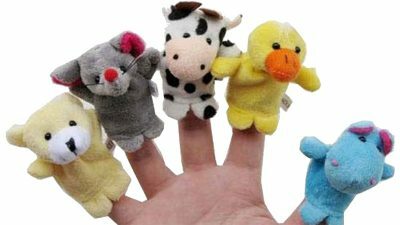 If your toddler is into pretend play, these finger puppets are great boredom busters. Have some songs and nursery rhymes ready in your repertoire. If you have the Little Red Riding Hood puppets, you and your child can do that story together. Or you can make up your own story. There is a travel version of aqua doodle which is lighter and smaller. For those of you not familiar with the aqua doodle, it’s a mess-free way for kids to draw. It’s made of a mat and a pen. You put water in the pen and draw on the mat. And that’s how it works! No ink, no crayons, nada! When the mat dries, you can draw on it again. If your child likes to draw, get this. It is a godsend. It’s useful not only when traveling. 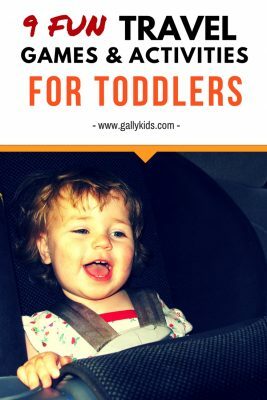 You can take it with you to restaurants and other places where there might not be many things to interest your toddler. The thing I love most about beads? They’re a good quiet time activity. If you can get your child into playing with beads, it’s great. You might even get lucky and have a few minutes to yourself. Get the beads for making bracelets. They’re small, so if you still have a child who puts everything in his mouth, you will need to closely supervise him. There are many ways to play with beads. One of the things I like is to use pipe cleaners instead of a thread. It’s easier for toddlers to thread the beads in rather than thread. After that, you can even make the pipe cleaners with beads into different shapes. If you want, you can also use only one color of beads for each pipe cleaner to learn about colors. If that’s the kind of thing you like doing at 36,000 feet! Here’s Mudpuppy 12-Piece Puzzle. This is another time activity that your toddler can do by himself. 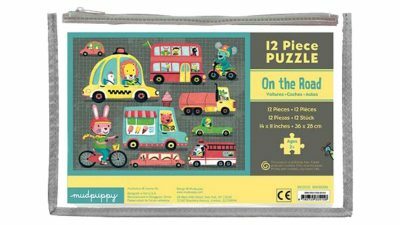 You’ll also be happy to know that your child is developing his spatial skills while doing it.For younger toddlers, these 2-6 piece puzzles are great. For older toddlers, check out the puzzles in a pouch by Mudpuppy. Choose the design that you think your preschooler would love best. There are over 55 pieces inside this tin. The idea is simple. There’s a tin. Inside it are magnetic figures. 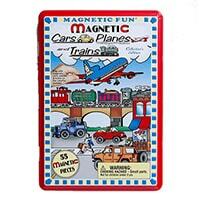 And from these magnetic figures so many magical things can happen. Your child can play pretend with the figures. You can also use it to teach things like colors, vocabulary and even numbers (how many cars have red in them? )Buy one that includes scenes your toddler is interested in. Some of the themes I’ve seen are vehicles, Disney princesses, farm animals, zoo, Mickey Mouse, Noah’s Ark and Curious George. You’re probably beginning to see a theme in this article. I prefer toys that give kids time to themselves and I want them light and small. And these quiet books are amazing! There’s a lot of handmade ones on Etsy if you’re looking for a special personalized one. If you don’t have a quiet book like this yet, you should get them – not just for traveling but for the home too! 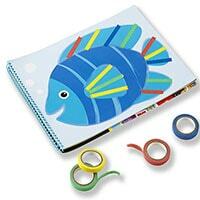 Each page in the book is meant to practice your child’s fine motor skills. There is a page for zippers, another for shoelaces, another for hanging the washing(! ), putting clothes on a doll and so much more. Each book is different so find one that has tasks you think your child would be interested in doing. Why not travel and teach your toddler some basic concepts at the same time with this Alphabet travel flashcards? 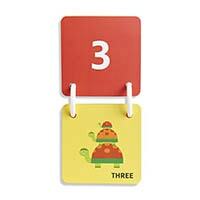 The flashcards teach the alphabet, numbers, shapes and colors. It also includes words for both English and Spanish. This is a good-size “travel” desk for doing things on. One that’s going to come in very handy when traveling by plane or car. It’s just the perfect size for kids laps. 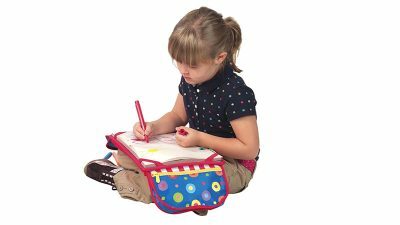 It also has 2 handy pockets that they can use to keep pens and crayons in. 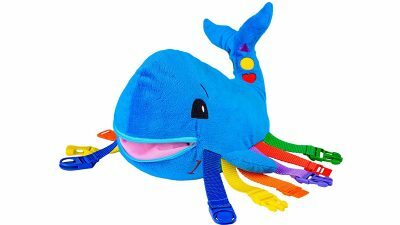 You might dismiss the Buckle Whale Toy as being too simple. But that’s where the genius is. If your toddler is into buckles or putting things on and off, she could spend a long time figuring this thing out. Many parents who’ve got this love it. And so do their little ones. Sometimes, some of the most simple things are the ones that kids like to play with especially at this age. This is when stickers or painters tape come in handy like this Painters Tape Book. Buy some colorful painters tape at the dollar store. Have a toddler-and-airport-security-friendly pair of scissors, too. Then print some pieces of paper with zigzag lines, numbers, alphabets or figures. Your child can then tape onto the lines on the paper. 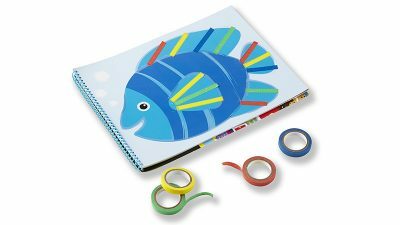 The fish picture above is from Melissa & Doug’s tape Activity book which has colorful and captivating scenes that your child can tape on. I’m not sure what flight attendants think about decorating the windows, but I think this is a great idea. 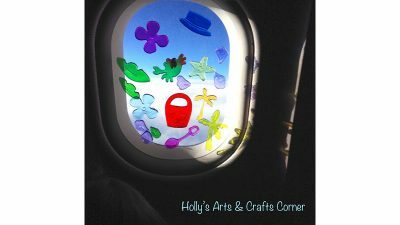 Use gel clings for this activity, so you can easily take them off when you leave the plane. If you’re not too sure about decorating the windows, you can always do the same activity on a sticker book. You can’t go wrong with books. Have a favorite book in hand as well as a new one. Books about planes or traveling or about the place you’re going to are always good to have. In case you don’t have the following books yet, this is a good time to get them. These are top-rated bestselling books that many toddlers love. They will keep asking you to read them. They’re great. If you’re crafty, you can make your own busy bag (or busy folder). Otherwise, get this one by Curious Minds. It has 6 different activities all together. 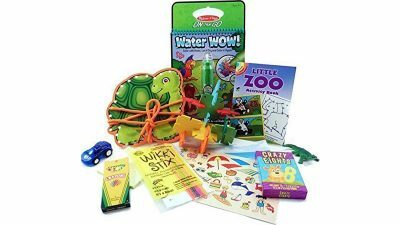 The activities include Wiki Stix, a water doodle pad, a carnival game, a water painting set (much like the aqua doodle but smaller), and some art papers and pens. Put each activity in one Ziploc bag and not give them all to your child at the same time. Oh, the many things you can do with the humble pipe cleaners. First of all, you can use them for the beads mentioned above. And then you can make shapes and other figures with it. You can also make holes on a Pringles cover and use it as a toy for fine motor skills practice. This activity toddlers can do for a long time. Together with pipe cleaners, yarn balls are always handy to have, too. Take a clothespin to substitute for a tong and again use it for fine motor skill practice. You can get your toddler to sort them by colors or just simply move them from one container to another. Afterward, you can use it for a gluing activity. 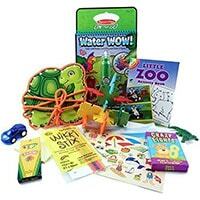 Take playdough in mini packs and use them for educational activities on the plane. You can make playdough a little bit more novel and exciting by using activity mats.